The crew of the USS Theodore Roosevelt witnessed a change of command ceremony last week as Capt. 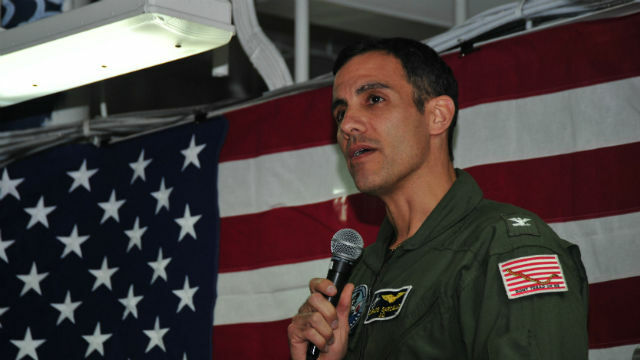 Carlos A. Sardiello took the helm of the San Diego-based aircraft carrier. Sardiello succeeds Capt. Craig “Clap” Clapperton, who was praised for his leadership and in turn thanked his crew during the ceremony on the flight deck. During his command the Roosevelt successfully completed an eight-month, around-the-world combat deployment in support of Operation Inherent Resolve. The carrier launched 1,812 combat sorties, totaling 10,618 flight hours, and dropped more than one million pounds of bombs on enemy targets. Clapperton’s next assignment is as commander of the Naval Air Forces Command. Sardiello, the new commanding officer, is a native of Fremont and a 1990 graduate of the Naval Academy.